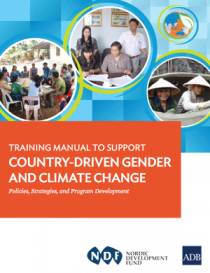 The challenges women face adapting to climate change have tended to overshadow the roles women play in mitigating climate change. 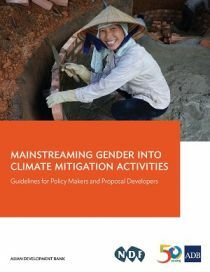 This project, entitled Harnessing Climate Change Mitigation Initiatives to Benefit Women, sought to compensate for that inattention by supporting gender-responsive mitigation in Cambodia, Lao PDR and Vietnam. It was financed by the Nordic Development Fund, managed by the Asia Development Bank, and implemented by the Institute for Global Environmental Strategies and SNV Netherlands Development Organisation. Active participation on behalf of the project in the online discussion organized by the International Climate Fund (ICF) with the theme Engendering Climate Change Practices. Disabled women take vocational training to boost opportunities to make a living. 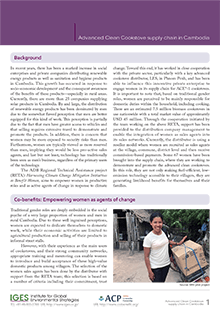 RETA 7914 is referenced in IUCN’s latest publication on gender and climate change: Aguilar, L., Granat, M., & Owren, C. (2015). Roots for the future: The landscape and way forward on gender and climate change. Washington, DC: IUCN & GGCA on it’s Chapter4.1. 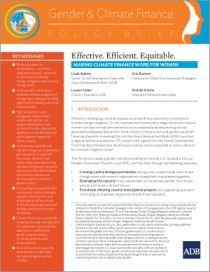 Flipping the Switch: Ensuring the energy sector is sustainable and gender responsive. By Rojas, A., with Prebble, M and Siles, J.
Andy Wehkamp, SNV Management Director for Energy commented on the RETA in her presentation. Presentation by Mr. BounEua Khamphilavanh, Senior Official, Department of Disaster Management and Climate Change, Ministry of Natural Resources and Environment, Lao P.D.R. 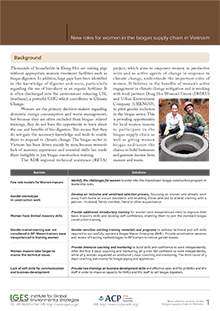 Gender mainstreaming into Biogas supply chain support the implementation of National target program on New Rural Development in Quang Binh province. The use of innovative business models for Distributed Renewable Energy (DRE) access. (Panel 3).